Offered here is a fantastic piece of ORIGINAL ARTWORK from the incomparable Alex Ross that features ACTION COMICS #858 COVER with the LEGION Of SUPER HEROES. This is an ORIGINAL DETAILED PENCILS / ARTWORK PRELIMINARY COVER SKETCH of Superman and his 31st Century friends. This is a standard pencils on art paper and measures 9" x 12". The artwork is also HAND SIGNED by Alex Ross. I also have a small b/w copy of the original post from Alex's website with the title and listed price. I have 2 different type of photos, the darker style is to show more of the detail, the lighter photo is what the artwork and paper really look like, white paper and standard pencil. Will look amazing framed and hanging in your gallery. 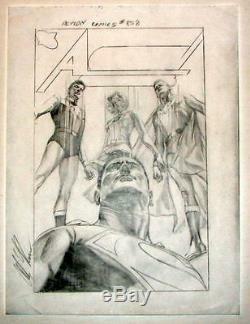 The item "Alex Ross ACTION COMICS 858 w LEGION ORIGINAL DETAILED COVER PRELIM SKETCH" is in sale since Friday, August 23, 2013. This item is in the category "Collectibles\Comics\Original Comic Art\Drawings, Sketches". The seller is "masteraddams" and is located in Hatfield, Arkansas.